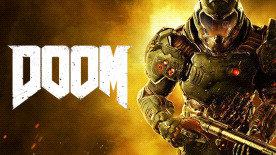 Developed by id software,the studio that pioneered the first-person shooter genre and created multiplayer Deathmatch, DOOM returns as a brutally fun and challenging modern-day shooter experience. Relentless demons, impossibly destructive guns, and fast, fluid movement provide the foundation for intense, first-person combat – whether you’re obliterating demon hordes through the depths of Hell in the single-player campaign, or competing against your friends in numerous multiplayer modes. Expand your gameplay experience using DOOM SnapMap game editor to easily create, play, and share your content with the world. You’re here for a reason. The Union Aerospace Corporation’s huge research facility on Mars is overrun with fierce and powerful demons, and only one person stands between their world as ours. As the lone DOOM Marine, you’ve been activated for one purpose – kill them all. DOOM is back! id Software's iconic FPS series is getting the reboot treatment, and everything that we've seen so far suggests that it'll be more brutal than ever. The E3 showing was stuffed with over-the-top action, twitchy gunplay, and lots of monsters going splat. It looks like the devs are going back to basics with this one, and that suits us just fine. The shotgun looks like it'll be dishing out some serious pain once more, and the BFG tease at the end of the E3 trailer had us punching the air in delight. We're on a highway to Hell, and it's going to be a ride to remember.